Paarite: Mineral information, data and localities. Named by Emil Makovicky, Dan Topa, and Tonci Balić-Žunić in 2001 in honor of Werner H. Paar (Salzburg, 15 September 1942 - ), Professor of Mineralogy at the University of Salzburg, Austria. 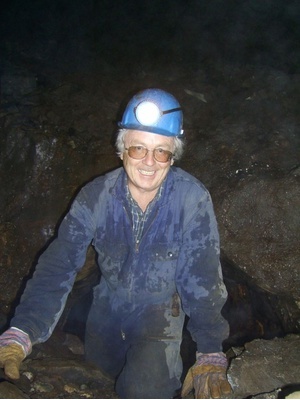 He made special contributions to the ore deposit potential in the Austrian Alps. Topa, D., Makovicky, E., and Balić-Žunić, T. (2004): Mineralogical data on salzburgite and paarite, two new members of the bismuthinite–aikinite series. Canadian Mineralogist 43, 909-917. Topa, D., Makovicky, E., and Balić-Žunić, T. (2005) Mineralogical data on salzburgite and paarite, two new members of the bismuthinite–aikinite series. Canadian Mineralogist: 43: 909-917. Petrícek, V., Makovicky, E. (2006) Interpretation of selected structures of the bismuthinite — aikinite series as commensurately modulated structures. The Canadian Mineralogist: 44: 189-206. Cuchet, S. & Topa, D. (2016): Gladit, Krupkait, Paarit und Salzburgit: 4 neue Sulfosalze aus dem Binntal VS. Schweizer Strahler 50 (3), 15-19 (in German and French).